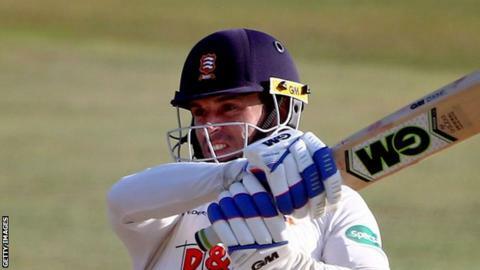 Mark Stoneman fell just of a double ton for Surrey as Essex's Ryan ten Doeschate starred to help his side close in on their 400-run target. Stoneman was ousted on 197 as Surrey were whittled away swiftly early on, but Essex found themselves 134-4 when ten Doeschate came in. He and Bopara (64) enjoyed a 120-run stand for the fifth wicket, while James Foster and Simon Harmer came and went. Ten Doeschate was still there at stumps, unbeaten on 120. England hopeful Stoneman was the hero on day one and his agonising exit was only softened by the fact he surpassed his previous first-class best of 187 with his tally. Surrey came out firing with the ball and Alastair Cook exited on 31 from Sam Curran's delivery just before lunch, and some tight bowling kept Essex at bay after the break. Tom Westley and Nick Browne were sent packing as Surrey put the squeeze on, before Bopara and Ten Doeschate steadied the ship to take it to 189-4 at tea. Netherlands international Ten Doeschate maintained his rhythm after tea, amid some excellent bowling by Mark Footitt in particular, and nursed the home side to within 32 runs at the close.